After months of anticipation, today was the first day of filming my National Geographic Channel show: Get Lost in Korea. Although it took some getting used to, I felt pretty comfortable with the camera by the end of the day. Jesse and my day started with a train ride from Seoul to the salt flats of Jeung-Do, Sinan. 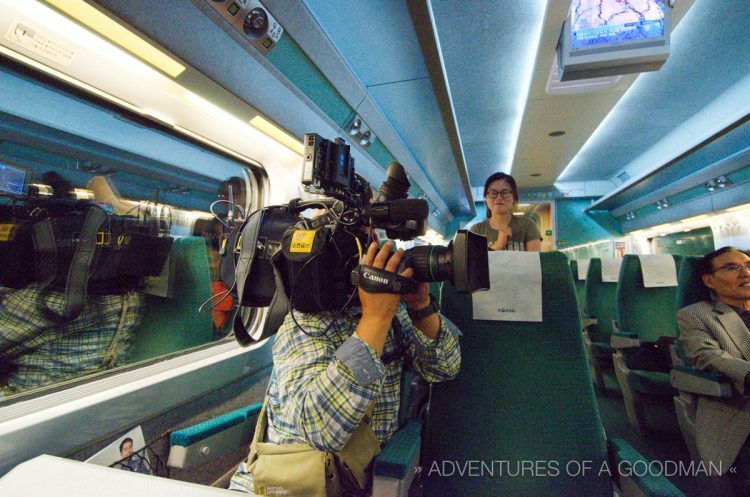 We were filmed getting into the train station, purchasing our ticket, boarding the train and chatting in our seats. Plus, the cameraman took some closeup shots of me editing photos. The shooting script called for a day of bike riding in the heat, speaking with workers at the salt flats, eating salt ice cream and getting to know the Slow City of Jeung-Do. However, Mother Nature had other ideas and we spent most of the day shrouded in fog and rain. Although that meant that no one was working, it did make for some pretty atmospheric photographs. After wandering over the above bridge, the crew called it a wrap for the day. We drove a few hours, had dinner, checked into a hotel and said goodnight. Tomorrow is another early day.